New York Yearly Meeting is a fellowship of local members and meetings, an organization with staff and committees, and a gathered body that meets in busines sessions three times a year. Also on this page; NYYM people, geography, finances, communications, handbooks and bylaws, institutions, and affiliations. Welcome to pages describing New York Yearly Meeting's organization. Local meetings. The yearly meeting is comprised of more than 80 local meetings and worship groups, including a number of prison meetings and worship groups. Local meetings typically meet for worship once a week and for business conducted as a meeting for worship once a month, hence the designation "monthly" meeting. Local meetings manage their affairs through committees, typically having no paid professional clergy. Some local meetings have schools under their care. Regional meetings. Local meetings are organized into regional meetings, sometimes designated as quarterly or half-yearly meeting to indicate how often they meet to conduct their business. Regional meetings usually have committees, as well. The yearly meeting. The yearly meeting gathers as a body three times a year, in the spring and fall for a weekend rotating through the various regions, and for a week in the summer at Silver Bay YMCA on Lake George in the Adirondack Mountains, in Silver Bay, New York. The yealry meeting is so called because it traditionally met to conduct its business once a year. The Yearly Meeting organization includes a large number of committees organized into four sections: General Services, Ministry, and Witness. It also includes a number of staff. The Yearly Meeting also has a conference center, Powell House, located in Old Chatham, New York, and a school, Oakwood Friends School, located in Poughkeepsie, New York. 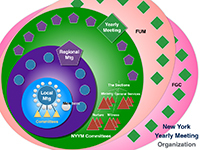 Organization chart—click the link to view a larger chart of New York Yearly Meeting's organizational structure. At its spring, summer, and fall sessions, New York Yearly Meeting gathers as a body to conduct the business of the yearly meeting. At these times, the Friends gathered are enabled to speak and act on behalf of the yearly meeting as a whole. Visit our Sessions Portal for more detailed information about NYYM Sessions, including web pages for past Sessions. New York Yearly Meeting's annual sessions (Summer Sessions) are held every year for one week in late July at Silver Bay YMCA on Lake George in the Adirondack Mountains, in Silver Bay, New York. Interim sessions are held in early April and early November. Spring and Fall Sessions are hosted by regional meetings throughout the yearly meeting on a rotating schedule. New York Yearly Meeting is comprised of local and regional meetings located throughout New York State and northern New Jersey, and two meetings located in southwestern Connecticut. Click the following to vew a large-scale Google map of our meetings.